← Color, Design and CR Laine Oh My! It’s that time of year again people, the Holidays are just about here! It’s now time to get your dining room ready for entertaining, you know the room in your house that you use about once a year? So brush off the dust and start thing about your color scheme! Having a Thanksgiving dinner party? Here is a Mood Board I designed to give you a few suggestions for your event and all these items are from Crate&Barrel. The key for your table is to obviously think color, particularly the color of the Autumn trees. A no brainer right? Right. I chose a blue plate because if you look at the color of changing leaves, they are mostly orange. Blue is just a nice complementary color to offset all that orange. I also put the plate on a hand woven rattan charger for texture. Adding just a tad more texture I have some acorns which you can put in a glass blow or disperse them on the table for interest. The birch branches will also look nice flat on the table or you can put them in a vase to add height to your table. As far as napkins, I have two kitchen towels to the right. The colors are great so alternate the red and orange. We all know how messy things can get at the Thanksgiving table so use these for your lap and provide regular napkins for your guests. I love the big chunky wood spoon and you can use that for serving mashed potatoes or for your salad bowl which also should be wood. See the metal cookie cutters in the leaf patterns? You won’t be using them to eat with but they sure make a cute accessory for the table. Keep adding color to the table until you feel you have enough. Again for this theme, keep the Autumn tree in mind. Enjoy your meal! 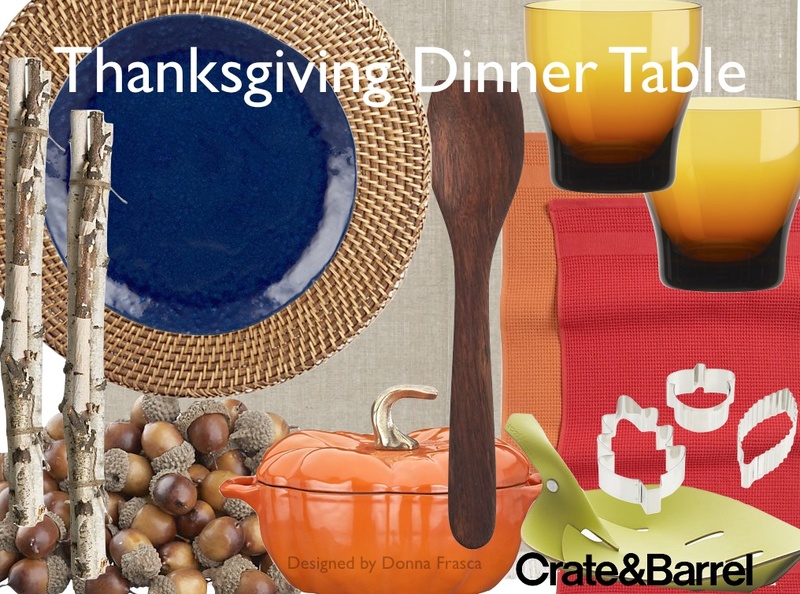 This entry was posted in Color, decor, Design, Dining Room, Fall Color and tagged autumn, autumn colors, blue plates, complementary colors, crate and barrel, fall trees, texture, thanksgiving, thanksgiving table. Bookmark the permalink.